This milestone marks another important step forward in the effort to embed virtual sensor technologies into HVAC systems, specifically in rooftop units (RTUs). CBEI researchers write that “studies have shown that RTUs tend to be poorly maintained and significant energy may be wasted annually due to unnoticed or unrepaired equipment faults.” This finding is fairly intuitive when we consider that these units are located on rooftops and performance losses are associated with fouling of air intakes and other issues that develop over time. Building on positive early results with FDD, the team has been working to alleviate market concerns that have kept manufacturers from incorporating FDD into their equipment. Manufacturers are slow to install FDD technology because the technology has not been low-cost and easy enough to install, manufacturers perceive uncertainty about the saving potential and economic benefit of the technology, and there has been a lack of integration and interoperability between FDD and other building technologies. The team is addressing all of these barriers by designing and implementing a suite of virtual sensors – refrigerant charge, cooling capacity, and coefficient of performance – using a low-cost microprocessor with four direct temperature (or pressure) measurements. “Ultimately, this virtual sensor package can be integrated within a RTU FDD system to provide an extensive fault detection and diagnostics capability,” the researchers write, and they’ll be able to do so without breaking the bank. A virtual sensor system (compatible with the VOLTTRON platform) has been designed and an initial prototype has been tested. The overall architecture of the virtual sensor system has been described including the data acquisition components and virtual sensor models. 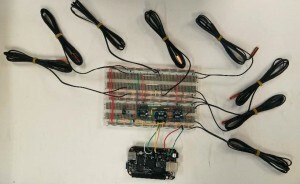 Initial prototype hardware has been designed that measures all required sensor inputs and is capable of running all software implementations. The software implementation has been described as well as future testing and evaluation plans to characterize the performance for different systems. Preliminary test results characterizing the virtual refrigerant charge sensor accuracy have also been described.